Intellectual Piracy allegations against PM Modi office on the gift of Holy Gita to the President Obama is recently observed in media. If this hold true then it is a serious charge. Already PM Modi is under media fire for his silence on protecting the merit and skills of aspiring Indians in Vyapam, and other Scams. It is evident by media reports that a 12th.class failure in Madhya Pradesh state can become a qualified doctor if he pays 1.5 crores to organized promoters and leave the answer sheet blank which gets `doctored` with 100%marks. Mahatma and his philosophy is a global selfless people`s legacy. Mahatma Gandhi version of Gita should remain transparent and should not get into any controversy of repacked versions without approval of the original writers. PM Modi had gifted the Bhagwad Gita to President Obama on September 30, 2014 during the dinner hosted at the White House. On gifting the sacred book, Modi had said that India’s guiding philosophy was inspired by Buddha and Mahatma Gandhi as far as India is concerned. “We believe in non-violence,” he had added. The media was engaged with Modi-Obama friendship (dosti) and promotion of Gandhigiri in the past as seen in the two media cartoons used in this text. For those who missed the past stories may see the link. 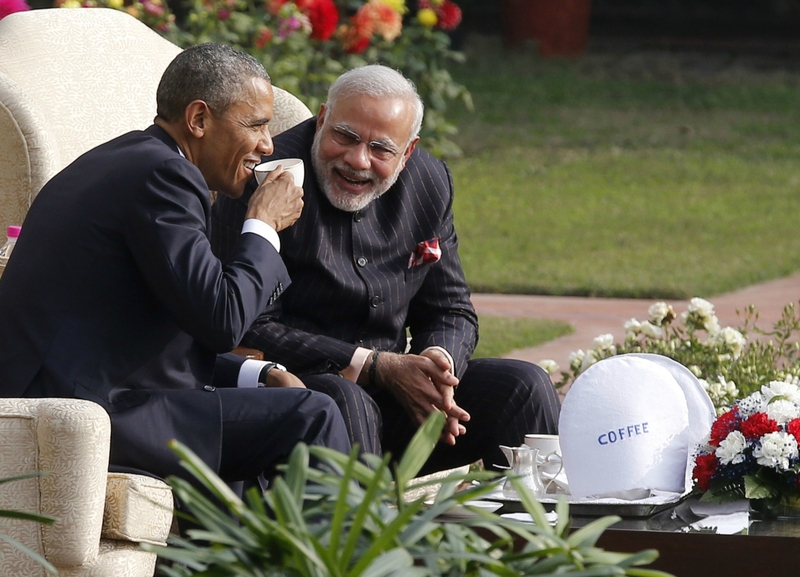 Obama`Namaste`- Can it Help Friend India Grow Fast? Media forgot to focus on the version of PM Modi`s popular gift Gita to foreign dignitaries. However, the Bhagwad Gita presented by Modi to Obama calls it “special edition”, with the following wordings, “Presented by Prime Minister of India Narendra Modi.” There is no name of Mahadev Desai on the cover. Mahadev Desai’s grandson Nachiketa Desai , a senior journalists from Gujarat and currently working as consulting editor (political) with the United News of India has made this accusation. – Who was the author of the Bhagvad Gita book presented to Barack Obama by Narendra Modi? – Who was the publisher of this Bhagvad Gita book? – Was the book title changed from its original title? – Was the author or publishers permission taken by PMO before changing the title? – Please provide copy of the bill used for purchase of the book. From which store/organization was the book purchased? – Who recommended to present the book to Obama? – Who all approved to present the book to Obama? – Who all read the book in PMO before it was offered as gift to Obama to ensure that there was no vulgar language in it? – Did the book underwent security checks before it was presented to Obama and at which locations? – What is the ISBN of the book? It is high time we must collectively find out people`s way to keep both Gita & Gandhi alive. This needs a transparent honest promotional mode with no personnel strings attached as profit.